Kemi Tourism Ltd. offers unique experiences in Sea Lapland, the most south-western region of Finnish Lapland. Through Experience 365, the region’s one-stop-shop website, visitors can browse and book all activities and accommodation in the Kemi region, all year round. From cruises on a real icebreaker ship to snow safaris and white-water rafting, every day is a good day to travel to Kemi. Located by the Bothnian Bay, at the mouth of the Kemijoki river, Kemi is within easy reach of Oulu and Rovaniemi airports, as well as Luleå airport in Sweden, or a one-and-a-half-hour flight away from Helsinki. Kemi also has its own airport, and a 20-minute car drive will take you to the Swedish border. Moreover, Kemi can be reached by sea, by arriving at the city port, where it can be arranged for ‘sailor elves’ to greet new arrivals. 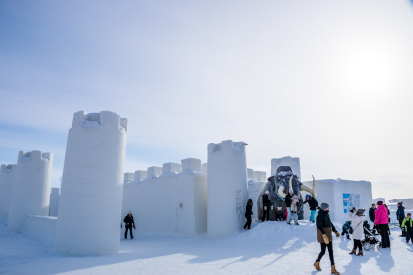 The Kemi region is perhaps best known for its longstanding history of building snow and ice castles, and the tradition continues each year with the building of the SnowCastle and the SnowHotel during the winter months. 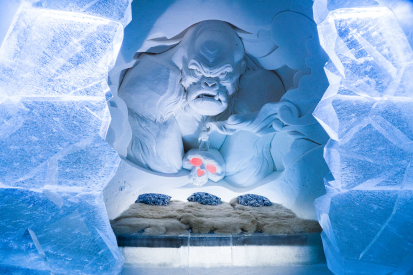 At the beginning of 2019, a main building offering various snowy attractions and activities every day of the year will be opened. 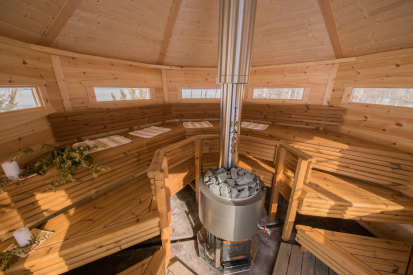 “Previously, we were only able to offer these attractions during the winter months, but now they will be available for everyone to enjoy, all year round,” says Susanna Koutononen, chief executive officer at Kemi Tourism. The services available at the new building will include a sauna and day spa, offering various Finnish beauty and cosmetology treatments, as well as the award-winning heated SnowRestaurant, showcasing the very best of Arctic delicacies, as well as an ice-cream bar serving homemade SnowCastle ice cream. There will also be meeting rooms, and the seaside restaurant can be transformed into a space for events and conferences. “The idea is to provide our guests with a resort, where they can find everything under one roof. Our trusted partners who provide trips and activities will operate from booths on the main floor, making it very simple to plan the holiday and go on excursions every day of the year,” Koutonen states. Having served as an icebreaker for the Finnish government for more than 30 years, Sampo, as the ship is called, is now retired and being used as a cruise ship in the Gulf of Bothnia. It is the world’s only cruise icebreaker, and with a capacity of 180, the steel vessel offers day cruises from December to April for holiday makers looking for a truly unique experience. “Kemi is unique in the sense that it is one of the few places on earth where the sea freezes over completely. Sampo is like a moving museum as it has kept as much as possible of its original features and décor from the 1960s. Our guided English-language tours of the ship will share some of the ship’s history, and everyone on board will sense the bygone glory of the vessel, even today,” Koutonen says. 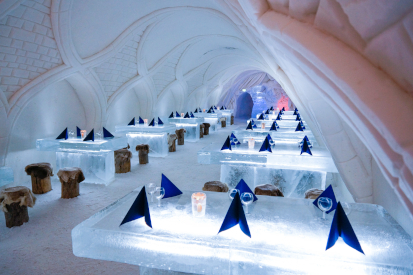 For an added thrill, visitors can go ice floating among the sea ice, broken by Sampo. Wearing a special, padded floating suit, floating among blocks of ice in the open sea will be a one-of-a-kind experience. In addition to this, in the heart of the ship lies an atmospheric restaurant, as well as a souvenir shop and a café. There is also the possibility for a snowmobile icebreaker safari, which means a journey across the frozen sea towards Sampo, where it will be waiting for visitors in the middle of the Gulf of Bothnia. “Whatever package guests choose, this is a truly extraordinary way to experience the Arctic nature, and an incredible icebreaking adventure, with the added experience of swimming among the ice,” the CEO says. Kemi is also the home port of Santa Claus and Santa’s Seaside Office, where families are greeted by sailor elves, and visitors can stop for lunch and join in with activities such as the elves’ sailor school, for example – and to meet Santa, of course. “We are also a home to the world’s first ice-driving location on frozen sea. Visitors can take their pick between a Tesla or a Lamborghini, and take the car for a spin on the frozen sea. We also have snow shoes, skis, sledges… almost any snow accessory anyone could think of, we have it. There are ample chances for once-in-a-lifetime experiences here,” Koutonen enthuses. Another big draw at the resort are the Seaside Glass Villas, located right by the sea. 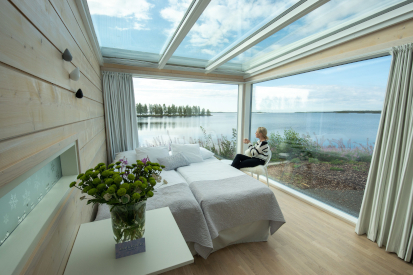 They offer stunning views across the archipelago through the glass roof and floor-to-ceiling windows. “A vast open field of frozen sea opens in front of the villas in the winter months. During spring, you can observe the fascinating transformation as nature wakes up after a long winter: the sea melts and birds return to Lapland in large flocks. 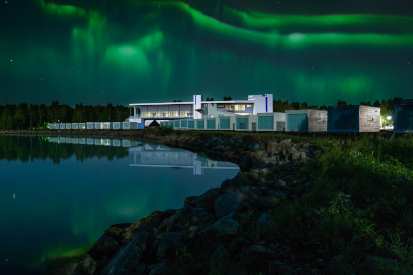 The glass ceiling makes for a great way to watch stars and try to spot the aurora borealis, which can be visible from late August until late March,” explains Koutonen. The log houses, made entirely of Finnish wood, have a kitchenette and en-suite bathroom. Offering luxury accommodation throughout the year, the seaside location of the villas provides an excellent opportunity for visitors to start their activities right at their front door. Activities can be arranged so that the pick-up is organised – for example by snow mobiles or a speed boat – directly outside the villas. The central location of the villas also means that guests are among all the activities of the resort and the whole city, but also completely surrounded by nature. Despite the status as a winter wonderland, there is plenty to see and do in the region throughout the year. In the summer, the ‘white nights’ – when the sun does not go below the horizon – are a magical experience, giving tourists the opportunity to go on activities at any time of the day. 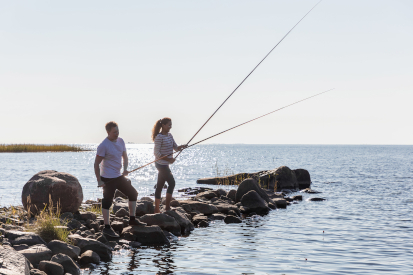 From a sailing-boat trip across the picturesque scenery of the Bothnian Bay archipelago to white-water rafting on the largest free-flowing river in Europe, there are plenty of activities for every kind of visitor to choose from. During autumn, the ‘ruska’, when the leaves turn into various shades of red, yellow, orange and brown, is a spectacular sight. “We have built everything with our guests in mind: everything at the resort is within easy reach, making it easy for holiday makers to plan their activities and explore the town. The Arctic is often considered to be a cold, snowy and icy place – and it is that too, during the winter – but the different seasons all change the region completely. Whether it’s the summer’s midnight sunshine and surrounding green forest, or the autumn along with its changes in the colours of the leaves, or the northern lights brightening the sky during the dark and cold polar nights − there is so much to see. With the whole host of activities we have on offer, once-in-a-lifetime experiences are guaranteed in Kemi – every day of the year,” Koutonen concludes.